Have you found an online vendor selling New Grove Oak Aged? Again nothing for me. Spice and woody taste... maybe for mixer, with coke and ice..
40% ABV. Fresh molasses without sulfer (?). 100% French oak, of which 30% is new. I tasted these New Groves alongside offerings from Trois Rivieres. This is much more delicate than the TRs. Light and slightly astringent. Sweet palate. Spicy finish. Esters: 300 g/hL (but you couldn't really taste them). I'm not impressed, but I wouldn't hesitate to mix with it. Schönes Strohgelb mit Goldreflexen im Glas. In der Nase treffen elegante Holznoten mit frischen Früchten zusammen und Tabak trifft auf feuchte Erde. Im Gaumen zuerst recht bissig, dann aber schöne Aromen von Birnen, Pfirsich, weissen Trauben, Pfeffer, Muskat und ein wenig Karamell. Im Abgang leicht und trocken so wie ein biss in ein noch nicht reifen Apfel. Holz, weisser Pfeffer und Karamell begleiten das Ganze. Beautiful straw yellow with gold reflections in the glass. In the nose, elegant wood notes meet fresh fruits and tobacco meets damp earth. On the palate first quite snappy, but then beautiful aromas of pears, peach, white grapes, pepper, nutmeg and a little caramel. In the finish light and dry as a bite into a not yet ripe apple. wood, white pepper and caramel accompany the whole. 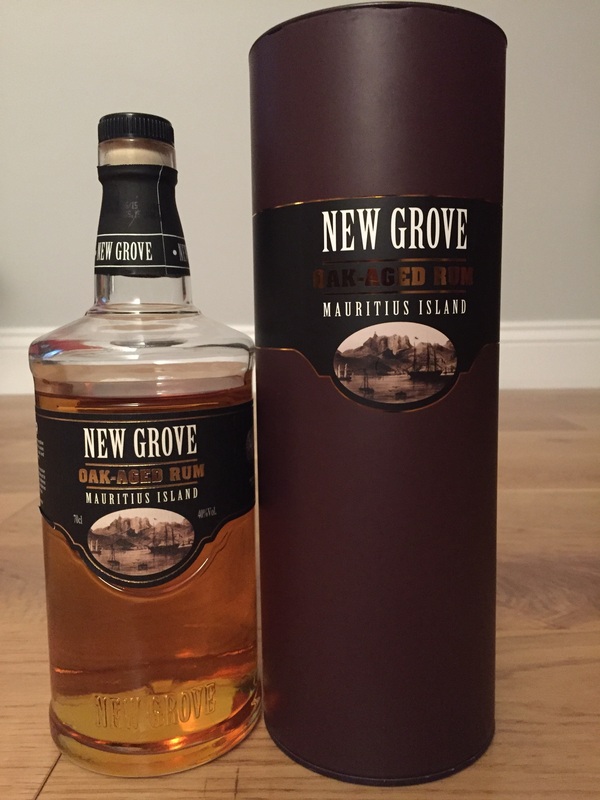 Enjoyed a glass of New Grove Oak Aged Rum from Mauritius. Decent bottle design, semi dark color, surprisingly woody to the nose. Pepper and more wood to the palate. A bit of burn at the end. Would be much better if it would be sweeter. Good rum and great value when bought from Mauritius airport. Not the best on the rocks but really good with mixer. Nice spice aroma and taste. Brought from an exotic vacation. Nice taste, but tastes even better when you celebrate a promotion. Nice rum, ok for sipping without ice, better with cola. Loads of pure alcohol in The sniff..Somewhat good taste.. The finish is like licking on a Oak plank..
wow, never again. sorry-hardly good for mixing - it was my first blind purchase without tasting and absolute waste of money. Half the bottle ended in my toilet. Absolutly not my cup of tee. So far the wost rum. Opravdu překvapivě výrazné tóny tropického ovoce povyšují tento rum nad standardní zlaté rumy.